Richard Russell was "a quiet guy. It seemed like he was well liked by the other workers," said Rick Christenson, an operational supervisor with Horizon Air who retired in May. "I feel really bad for Richard and for his family." 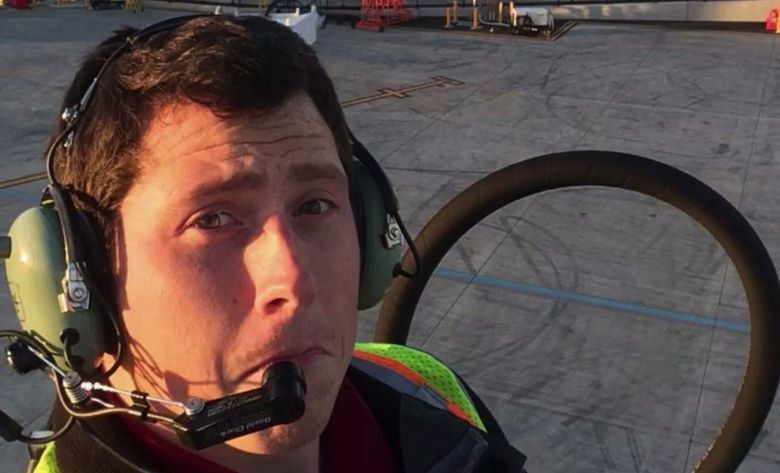 Richard “Beebo” Russell, the Horizon Air employee who stole a plane from Sea-Tac Airport on Friday night, performed midair acrobatics over Puget Sound and then crashed into an island, was an avid traveler, a high-school football standout and Christian youth leader who once operated an Oregon bakery with his wife. Russell, 29, was presumed killed in the crash of the Bombardier Q400 turboprop on Ketron Island, just west of Steilacoom. Investigators searched the site Saturday for the aircraft’s flight-data recorder and cockpit voice recorder. Russell worked as a member of Horizon’s tow team, Christenson said, and helped handle baggage for the airline. Two-person tow teams are responsible for moving airplanes on the tarmac. One person drives a tow tug, pulling the plane. The other communicates with the tower from inside the airplane’s cockpit and can apply the plane’s brakes in an emergency, Christenson said. Tow teams are trained how to use some airplane systems such as the auxiliary power unit, hydraulics and radios, said Christenson, who did not know Russell well. Before hearing that Russell was involved, Christenson watched as the incident played out Friday night. He was sitting on the deck outside of his cousin’s home, looking out at the Tacoma Narrows Bridge and Puget Sound. The sun had begun to redden and fall into summer’s haze. “It was absolutely beautiful,” he said. Suddenly, two F-15 fighter jets appeared, and took hard turns south. Ten minutes later, he said, a commercial plane cruised about 500 feet above his cousin’s home, he said. “We got binoculars and were watching him. He was flying real strange, hard banks, real radical flying for a Dash-8,” Christenson said. The plane plunged toward the water in a nose dive at one point. “We were all screaming, ‘Oh my god, oh my god,’ and I was yelling, ‘Pull up, pull up,’ ” Christenson said. Somehow, Russell pulled out of the descent, seemingly just feet from the water, then took off farther south. Later, when he saw a cloud of black smoke, “I knew what happened,” Christenson said. Word soon spread among former colleagues. He said it was difficult to listen to the audio recording, widely published on news websites, as Russell communicated with an air traffic controller. A man who answered the door of the Graham home of Russell’s mother-in-law Saturday afternoon said the family was in shock and awaiting more information before speaking to the media. Relatives were arriving at the home as members of the media gathered outside. They declined to answer questions. Airline and law-enforcement officials did not publicly confirm Russell’s identity, but provided some details of his background and how he was able to steal the plane. Tilden, speaking at a news conference Saturday at Sea-Tac Airport, said Russell had been with the company for nearly four years. Tilden said the plane was parked at Plane Cargo 1, in the north side of the airport. The plane was not scheduled to fly Friday evening. “The individual did use a pushback tractor to rotate the aircraft 180 degrees so he could then taxi the aircraft,” said Mike Ehl, a Port of Seattle official, confirming that the man did that himself, first driving the tractor and then the plane. Horizon CEO Gary Beck said the ground-service agent, who is not believed to have had a pilot’s license, pulled off some “incredible maneuvers” once airborne. Authorities believe Russell was the only person aboard the airplane. “But of course we haven’t confirmed that at the crash site,” said Jay S. Tabb Jr., the special agent in charge of the FBI’s Seattle division. The Pierce County Sheriff’s Department on Friday night speculated Russell may have crashed the plane intentionally. According to sheriff’s spokesman Ed Troyer, that theory was based on Russell’s recorded conversation with air traffic control and at least one pilot who were trying to talk the man they called “Rich” into a safe landing. Russell said at one point that he didn’t know how to land the plane and “wasn’t really planning on landing it.” He also apologized to all the people who loved him, acknowledging they would be disappointed. Some audio from the exchanges is unclear and provides a murky window into his thinking. “Think I’m gonna try to do a barrel roll and if that goes good, I’m just going to nose down and call it a night,” he said toward the end of the recorded audio. What he meant by “nose down” was unclear. Russell was born in Key West, Florida, and moved to Wasilla, Alaska, at age 7, according to a blog he maintained. Biographical details in the blog posts correspond to information provided by authorities, including the city in which Russell lived, his age and his employment history. Russell excelled in track and football at Wasilla High School, according to an Alaska newspaper, the Mat-Su Valley Frontiersman. On the blog, Russell says he met his wife in Coos Bay, Oregon, in 2010 while both were going to school. They married one year later and a month after that they opened a bakery in Oregon, which they ran for three years, according to the blog. Russell, who didn’t have baking experience, was his wife’s apprentice, he told the Coos Bay World for a 2012 article. She told the newspaper Russell was laid-back and liked to tinker with experimental recipes. Russell was active in church, and served as a leader in the local Christian youth ministry, Young Life. Holmes said Russell had a penchant for writing, and would sometimes ask her for short-story writing prompts. Russell says he got a job working for Horizon and used his travel benefits to frequently fly up to Alaska. Videos posted on his blog detailed visits to Dublin, Ireland, Misty Fjords National Monument in Alaska, and southeastern France. “In this season of life we enjoy exploring as much as possible, whether its a day (or so) trip to one of Alaska Airline’s destinations, or visiting a new area of Washington. We consider ourselves bakery connoisseurs and have to try a new one every place we go,” he wrote. At times Friday, while Russell was piloting the stolen plane, it sounded like he was was sightseeing. Russell told the air traffic controller he’d flown around Mount Rainier and looked at the Olympic Mountains. Seattle Times staff reporters Scott Greenstone, Agueda Pacheco-Flores, Matt Day, Daniel Beekman and news researcher Miyoko Wolf contributed to this story.